As you can tell from the many recipes I post, I have a thing for Asian food. I realized the other night that it has been forever since I’ve had fried rice. I just always seem to order an entrée with my rice on the side at restaurants instead of getting it all mixed up. I did a quick check and I had all the ingredients needed for fried rice, so I figured why not. Then I decided that I could get a little creative with my fried “rice” and use more of the riced cauliflower like I did with my tabbouleh. Seriously cauliflower rice is one of those great inventions that you wish people had come up with long ago. That and zoodles. Sigh. I will add that Trader Joe’s now has broccoli “rice”, but I think that’s not quite the same idea. Broccoli isn’t quite a forgiving flavor-wise as cauliflower and zucchini. I even had a different lunch planned the next day and she specifically requested the leftover fried rice instead. So feel free to fly this one under the veggie hater’s radar. When I make substitutions like this, I try to use part of the real thing like rice and part of the substitute so the dish has some of the authentic flavor. It’s also a good trick to use when trying to cut back in other areas of your eating like part non-fat milk and part cream in your coffee, half the sugar in a recipe, half eggs and half egg whites, and so on. Place your cauliflower florets in a food processor and pulse a few times until it resembles grains of rice, or buy pre-riced cauliflower. Mix in the brown rice and set aside. Heat a large skillet or wok over medium high heat and spray with non-stick spray. Add the onions and garlic and saute for 1 – 2 minutes until the onion softens. 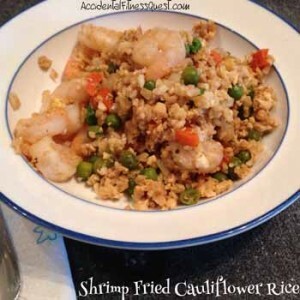 Add the cauliflower and rice mixture and stir fry for about 2 minutes until it starts to crisp a little. Push the rice mixture to one side of the pan and pour in the eggs. As the eggs begin to cook, stir fry the eggs and rice together to mix and continue cooking. Stir fry, working the eggs into the rice for about 2 minutes. Add the remaining ingredients and stir fry until the veggies and shrimp are heated. About a minute. Remove from heat and divide onto 4 plates. Makes 4 servings at approximately 216 calories each – 24g protein, 21g carbs, and 4g fat. I had a bag of frozen peas in the freezer and fresh carrots in the fridge. I diced my carrots and cooked them first to make stir frying go faster. You can also buy bags of frozen peas and carrots together to save this step. I would have used that method if I had them on hand. I used pre-cooked shrimp from Walmart and just removed the tails before stir frying. You can also use raw shrimp but stir fry them first before the onions and garlic to make sure they are thoroughly cooked. This turned out so well that I may try a Mexican version next. Shhhhh, don’t give away my secret.